Can you believe this? A member of a suspected syndicate, Adebayo Mubashiru, has confessed that he and his colleagues buy human parts, including skulls, eyes and teeth, for N12,000. The suspect was arrested along with three others in the Abeokuta and Owode Egba areas of the state by the men of the Ogun State Police Command. The state Commissioner of Police, Ahmed Iliyasu, said the suspects specialised in killing for ritual purposes. Iliyasu, who paraded the suspects at the headquarters of the Federal Special Anti-Robbery Squad, Magbon, Abeokuta, said the four suspects belonged to two different ritual syndicates. He said one of the syndicates, comprising Mudashiru and Rasheed Abass, who resided in the Totoro area of Abeokuta, were arrested on Thursday by operatives of FSARS. Iliyasu said the two suspects were sighted on a motorcycle with a suspicious bag by policemen, who were on patrol, and they were stopped for a search. He said the search led to the discovery of fresh and dried human parts, dead lizards and charms, adding that they were serial killers. He added that two other suspects, Lateef Aremu and Kolawole Shodipo, were arrested at the Owode-Egba area of the state the same day. Iliyasu said operatives of the FSARS received information about them and trailed them to their hideout, where they were arrested with the human skulls and bones. Mudashiru confessed to our correspondent that he and the second suspect paid N12,000 for the human parts. He, however, denied that they were ritual killers, saying they were looking for how to get quick money. He said he had been in the business for almost 20 years, adding that the charms and other items were found on them were meant to help people. He said he had once told Shodipo to bring human skulls for ritual purposes, which he (Shodipo) did. 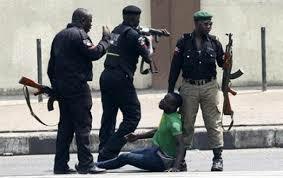 Also paraded alongside the suspected ritual killers were two suspected armed robbers, Michael Uko and Tope Adegoke. They were said to have robbed a victim and made away with his ATM card. They allegedly inflicted machete cuts on him and forcefully got his pin number, after which they withdrew N100,000 from his account.